After ogling at their Instagram for weeks, PIF and I finally made a reservation for Arbor, located in what used to be an underwear factory in the Logan Square neighborhood of Chicago. When I say we made a reservation, I don't mean we called and talked to the host, told him or her we wanted a reservation for two on Friday night at 7:30, then hung up and showed up at 7:30 on Friday night. Arbor does it completely differently. When PIF called one day to see if we could get a reservation for later that night, he was given the phone number of the chef and told to text him. So he did. 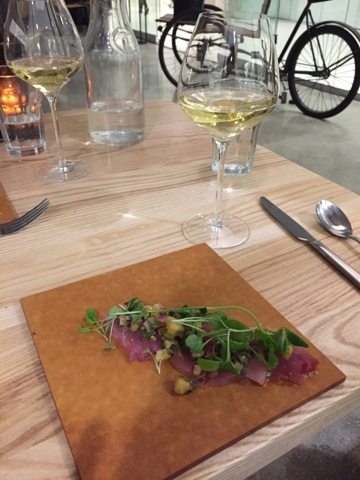 Via text message, Chad Little - the chef and owner of Arbor along with Leonard Hollander - explained to PIF how Arbor's entirely unique Midwestern Omakase worked. Only available on Thursday and Friday nights, Arbor crafts a 3-, 5-, or 7- course dinner tailored to your tastes and past experiences. Because they were fresh on our mind, PIF told Chad about the unique and delicious hamachi pipettes and amazing oxtail dish we had in Austin, Texas (and, incidentally, were part of a recent blog post, which you can read here). He also told Chad the intimacies of our food life, for example, how I am an "opportunistic" pescatarian, "who won't say no if you put a nice piece of pork belly in front of her." The day of our reservation, we still had no idea what to expect. 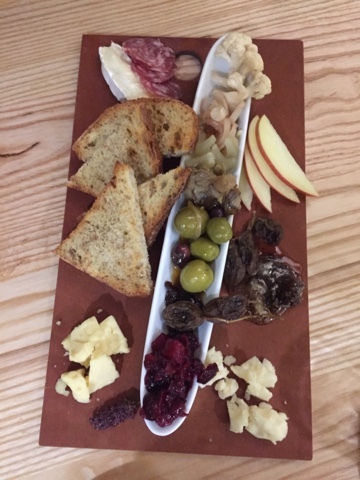 We were literally squirming with excitement as we rolled up to The Green Exchange, a repurposed and multi-functional space that was lively that Friday night. Smack dab in the center of the second floor, enclosed in glass walls with exposed ceilings and an assortment of tables to fit every seating preference, was Arbor. We walked in and in the slightly awed confusion of newbies tried to figure out what to do next. The restaurant, which also functions as a cafe by day, was dark aside from the light from the hallways diffusing softly through the glass. Small parties engaged in intimate conversation were scattered around at the tables, which ranged from high tops to two tops to benches. Over at the bar, obvious regulars were sipping on beers and cocktails comfortably while chatting with the bartender. As we stood there taking it all in and grinning like idiots, a handsome man-bun donning fellow approached us and, in an accented voice of ambiguous origin, asked where we'd like to sit. Being a sucker for cushioned seating areas and an even bigger sucker for nooks, I asked if we could take one of the little couched private booths. "Of course!" he responded and proceed to grab the closest table and carry it over to the little nook, which I had failed to notice was table-less. That turned out to be one of the least accommodating gestures we received that night. Alyosha, whose accent turned out to be Moldovan, immediately poured us a glass of a prosecco-like wine, which we sipped on as we gushed about our first impressions. 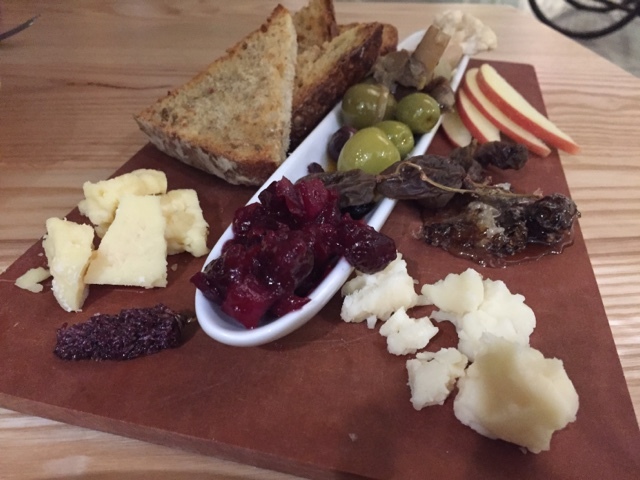 A few minutes later, one of the chefs appeared and delicately placed in front of us a colorful board, complete with cheeses, house-made bread, house marinated olives, picked onions and cauliflower, dried grapes, cherry compote, and honey from Arbor's hives, complete with the comb. I couldn't help but exclaim that that honeycomb was one of PIF's absolute favorite foods. Alyosha bonded over being resident aliens. By the time our next course arrived, the three of us were knee deep in an intellectual discussion on the history of world political movements. 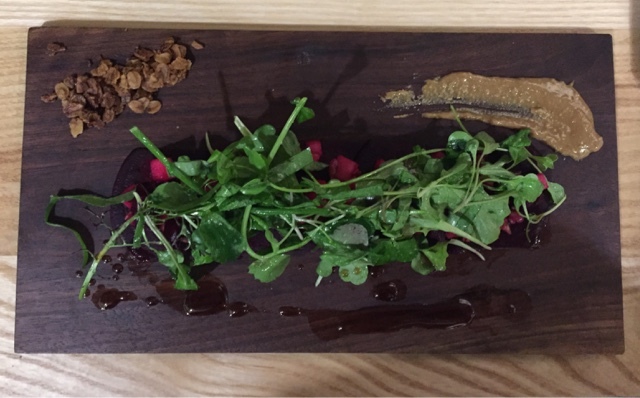 Course number two was a beet carpaccio topped with an apple and mixed greens salad and accompanied with housemade granola, sunflower butter, and fine vinegar, an interesting combination that perfectly combined the five tastes. 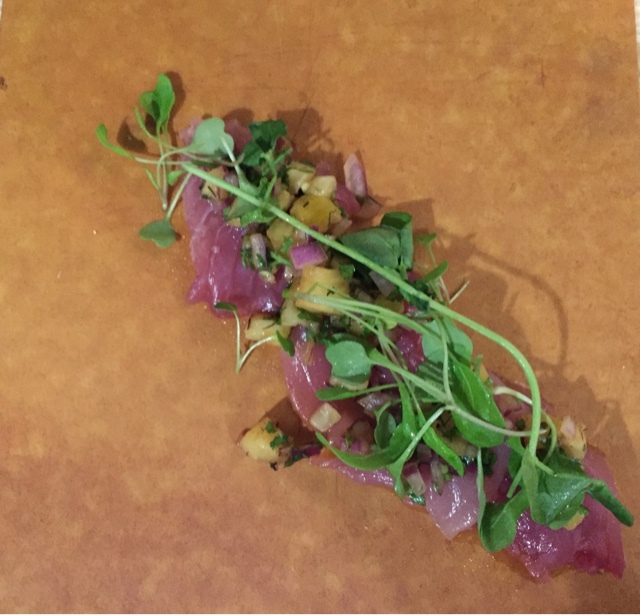 After that was the moon fish ceviche with pineapple, red onion, and sunflower sprouts. Don't know what a moon fish is? Neither did we. Luckily, Alyosha came in with the assist. Moon fish is round and flat (kind of like...a moon...) with a vibrant pink color and a deep fishy flavor kind of similar to tuna. Because of this, it was a heavier ceviche than those I have had with white fish, which was good considering it happened to be the first snow of the season. 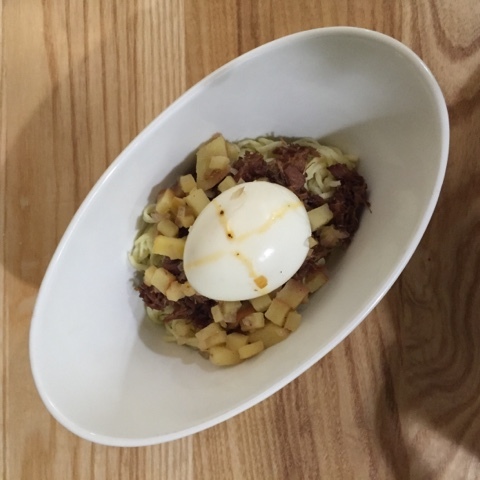 Next, Leonard brought out tagliatelle with apples, beef cheek, and a soft boiled hen's egg, inspired, he explained, by his trip to Italy. The pasta was just imperfect enough to make clear it was housemade. 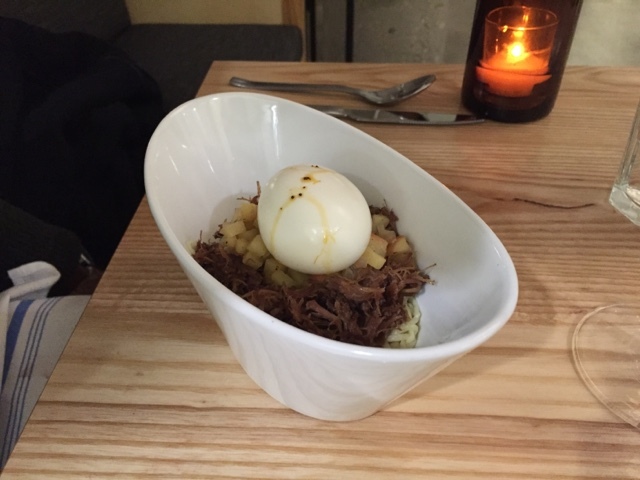 The soft, sweet, and slightly tart apples - an ingredient I have never before had on pasta of any kind - balanced the rich beef cheek, reminiscent of the ox tail from Austin's Vox Table. The egg, which was so beautifully boiled that I couldn't stop to snap a picture after cutting it open, was seriously one of the best I've ever had (and I've had a lot of eggs) and added an extra bit of moisture to the dish such that no sauce was needed. Between dishes, while PIF ran off to the bathroom for the third time (we were doing the wine pairing but...come on), Alyosha stopped by holding a bottle. "Do you like vodka?" he asked. "Oh, yeah," I responded, which elicited laughs from the couple nearby, who were somehow related to one of the kitchen staff. 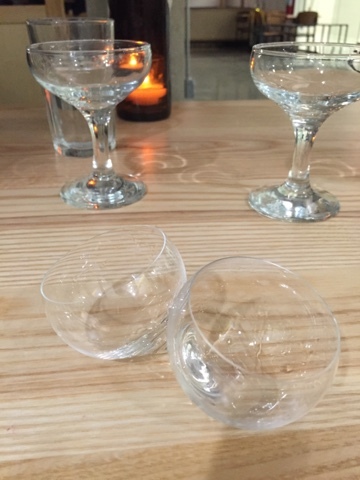 Alyosha set down two "eyeball" glasses and showed me what was in the bottle - St. George's green chili infused vodka. When PIF, making the short now-familiar commute back from the bathroom, caught sight that Alyosha was holding something new (remember, glass walls), he ran over, eliciting more laughs from the couple. Alyosha poured us two glasses and told us to sip it. Spicy, but relatively gentle, I immediately wanted to mix it with strawberry into a nice summer cocktail. But that's a topic of another post. Besides, the vodka was all but forgotten upon the arrival of the dessert. Leonard began to describe the small cake, made with butter, sugar, and flour, before PIF burst, "what is that?" 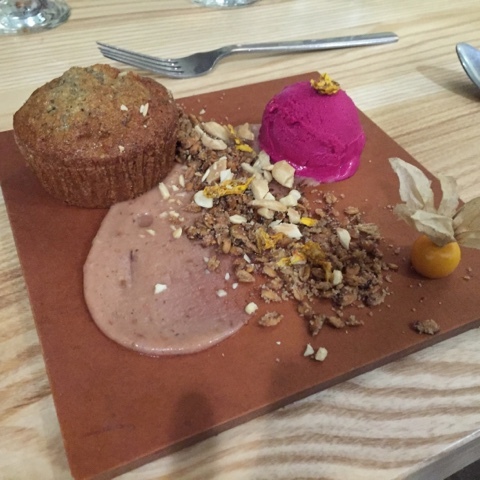 and pointed to the bright magenta frozen dessert that lit up the plate. It was beet gelato, which was creamy, tart, and true to the ingredient that gave it its brilliant color, which proved to be the star of the meal. Also gracing the plate was a subtle icing, crunchy housemade granola, and a golden gooseberry. Paired with a sparkling dessert wine, it was an all around perfect way to end the night. You may remember that there are few things PIF loves more than honeycomb. After dessert, Chad came out and told us he was going to bring us some to taste and we were so excited to get to extend our stay at Arbor a little longer. Shortly thereafter, he returned with a plate dotted with an array of golden to dark red puddles of honey (and some little chunks of "bee bread") each labeled by hand along the rim. Chad pulled up a chair and walked us through each one - honeys from various seasons, years, and states of processing from Arbor's own hives, inexplicably dark and chunky honey from the South Side of Chicago, bright orange sea buckthorn- and quince-infused honeys from Latvia, and propolis honey. 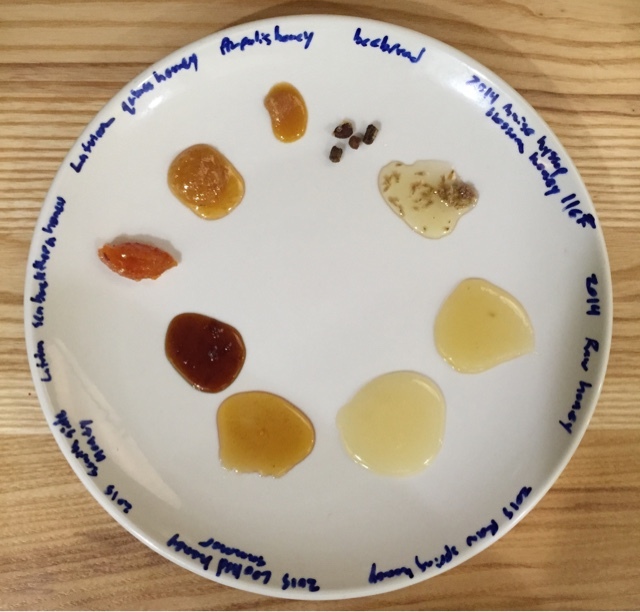 With little spoons, PIF and I indulged in each one, comparing flavor, sweetness, and texture and gaining a greater appreciation for the diversity and complexities of honey with each bite. 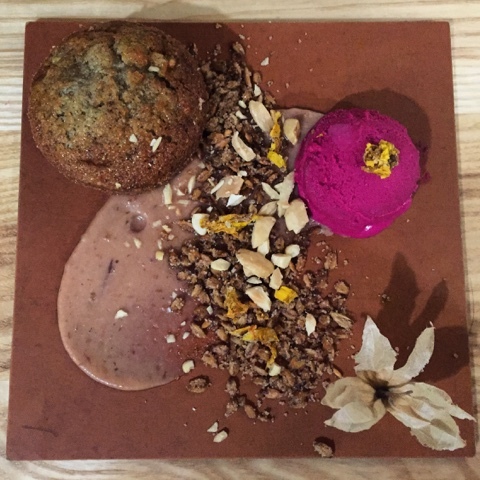 Eating at Arbor is kind of like eating a gourmet meal at the home of a close friend, assuming that friend also has a garden with 60 varieties of herbs, fruits, and vegetables at his or her disposal and happens to have studied the art of plating. Apart from the food, the meal was perfectly paced, with plenty of space between us and the next guess, and no sense of being rushed. It was comfortable to chat with the staff about anything from the plate put in front of you to world politics, a nice contrast from the normal divide between diner and waiter. All around, Arbor presents exactly what I look when I go out to eat - a chance to experience and learn something new, to feel a sense of togetherness, and to live entirely in the moment. And for that, we can't wait to go back. Read more about Arbor and Chad and Leonard's vision by going to www.arborprojects.com. Alyosha, like one of The Brothers Karamazov. Ohhhhhhh! *face palm* Thank you!! Empellón Fiesta at The Aviary! It's still a work in progress, but Three Times Per Day has upgraded! Check it out at www.threetimesperday.com !